Registration is now open for 2017 Sprockids Program! Visit the Sprockids page for more information or click the button above to register. The Hinton Mountain Bike Association recently acquired a new essential tool to help with year-round maintenance of the Hinton Bike Park and trail systems. The Rokon Trail-Breaker is a powerful yet versatile multi-terrain vehicle that will allow our trail maintenance volunteers to access all our trails. It can also be used during the winter and has proven to be an awesome trail-grooming tool on it's own! Expect to see HMBA's grooming volunteers on both the Rokon and the winter sled out grooming many of our trails this winter! Jay Hore Back as HMBA VP! 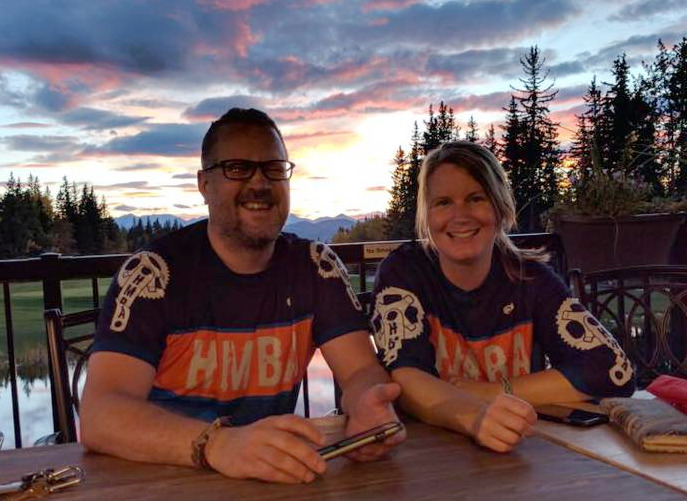 The Hinton Mountain Bike Association is excited to announce that Jay Hore is stepping back into his old HMBA bike boots as Vice-President. Jay was one of the founding members of the club and was on the Board since HMBA's beginning in 2007 until 2011. In 2012 and 2013, he was one of the main drivers in getting the Hinton Sprockids program off the ground. HMBA's previous VP, Brayden Langford, had to step down earlier this Fall. Although HMBA has lost some key Board members in the past few months, we have been fortunate to have others, such as Colin and Jay, join our Board - a changing of the guards, if you will! I ‘m excited to be back and involved with the HMBA after taking a few years off. Born and raised in Hinton, my family and I like to enjoy the Bike Park and trail network as much as we can. I’m a founding member of the HMBA, the bike park and Sprockids and I hope my experience will help the continued success of the HMBA. I find it extremely rewarding to give my time and energy to something that so many people get to enjoy while being active. I can’t believe the HMBA will be 10 years old in 2017 and phase 1 of the bike park will be 9 years old!!!! I’m looking forward to seeing what we can do in another 10 years. On the weekend of September 17th, Gulley Trail had some very rooty sections and other problem areas re-surfaced with 3/8" sand. This section of Gulley Trail extends from the Town of Hinton trail behind Reimer Drive, to the north entrance of Stinger, at the Hinton Bike Park. Mike Langford, Area Manager for AFD Petroleum, lent HMBA a skid steer for the job. Bill Heir spent over 22 hours transporting the sand from the Hinton Bike Park parking lot all the way to Gulley Trail, spreading the sand on the sections that needed the most attention. Huge thanks to Mike at AFD Petroleum!!!! A big shout out to Audrey, Keith, Maureen, and Bill for volunteering some time for the final touches!! The result looks awesome!! Great Day for a Work Bee! The day went really well - counting all the little kids, we had 25 volunteers. Members from the following families all chipped in today: Guthrie, Pratt, Trahan, Kadatz, McVey, Cherry, Myles, Beauchamp, Harper/Heir and a few other young folks. THANK YOU!!! We won't kid you, it was a ton of work! We only took about a 40 minute lunch break and worked 10 am to about 3:30 pm. Not much standing around. And if you look at it, you can hardly tell we were there. We all realize there is still so much to do to bring the park up to the level we want, especially in Flow Master, but we had a good start today. One of the best things is the realization by everyone there of the work needed and the effort involved. Those attending will spread the word and help again themselves. Mike drove his skid steer until the dirt was gone, which was an incredible help - wheelbarrows would not have cut it. Dallas Lambe and Motion Canada for the donation of 10 Silky trail saws and 4 Mcleod Tools! Mike Langford and AFD Petroleum for the use of the skid steer and expert operating services! Boston Pizza for donating 7 pizzas for our hungry volunteers! Bill and Maureen for their major contributions to the Park this year, coordinating the new solar security light at the parking lot this week and a super secret, super exciting trail maintenance tool to be announced soon. All the volunteers who sacrificed a beautiful weekend day to come out and make the Hinton Bike Park safer and more enjoyable to others! HMBA Welcomes Colin as New President! Colin Pratt, a longtime HMBA member, has volunteered to become our new President! A father of four young up-and-coming shredders, he and his wife Kirsten are both avid mountain bikers, participating both in local and out-of-town events. Am I an HMBA member? Do I love riding my bike in Hinton's backyard playground? Am I comfortable talking to town and industry representatives who are already great supporters of HMBA? Am I ready to be part of a great team? If you are answering YES to these questions, then please consider this opportunity!! HMBA needs you! Break down the negative thoughts that may be going through your mind! "I don't have the time." We hear you! The current Board also have many other life commitments. But with no Board, there is no HMBA and that would not be good. The Board meets about 10 times a year, plus the AGM in April. Depending on which projects we have going on, that determines the amount of involvement needed. Some Board members spend their time in areas where they are most interested. "I don't know how much I can contribute." Once you get to know how the Board runs and what we actually do, you will surely find plenty of ways to make your contributions. It really doesn't take much - and the first, the most important step, is just being INVOLVED. "I don't want to spend my time fundraising." Unless we are working on a big project (that has to be voted in by the majority), we are not spending our time fundraising. Really, we're not! HMBA has A LOT of great community and business support. Plus, we are a team - we work together on this! If you have any other questions or concerns - please TALK TO US! You can email us at infoATbikehintonDOTcom or catch us on the trails! 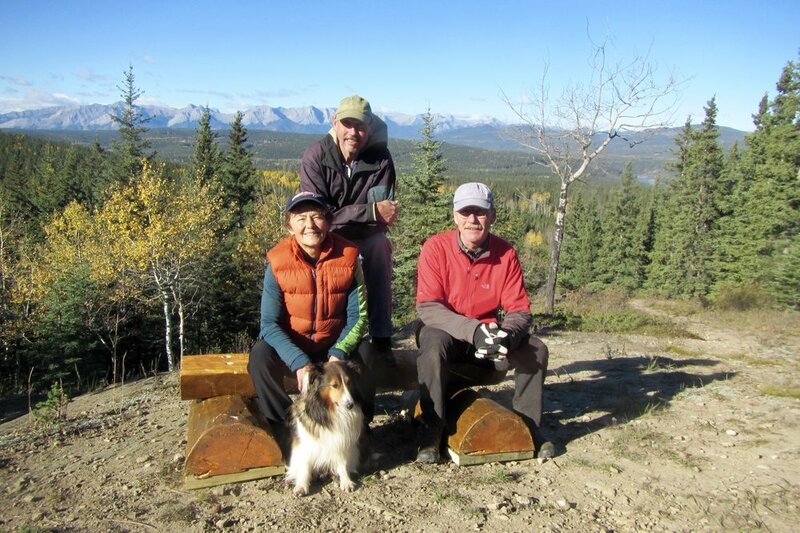 Julie is usually on the Ladies Monday Rides, Maureen and Bill are often out at the Hinton Bike Park, Brayden loves riding gravity and Kevin keeps an eye on the trails (usually riding, but not for a little while, due to injury) . Hot and dry weather in April created very, VERY, dusty conditions on the Robb Road adjacent to the Hinton Bike Park. After contacting the Town of Hinton and West Fraser about how to best remedy the situation (i.e. to stop chocking on dust while executing the Superman at the Dirt Jumps - hey, it happens! ), West Fraser used calcium chloride (retains moisture) on the road which did the trick! Then it started to rain. And rain some more. And it kept coming all summer. (Has it stopped yet?) Rain is good after such a dry spring, but it did create new challenges for our Bike Park, namely erosion. Again, the Robb Road became a source of sediment (just too much rain!) which flowed into the park at various points along Flow Master, the Dirt Jumps and the Skills Area. After positive discussions regarding the process of water diversion, West Fraser has re-graded the ditch and culvert area along the Robb Road, near the bottom of Flow Master. With a few touch ups, HMBA volunteers were able to make some additional small changes to the drainage which will hopefully prevent further erosion from culvert problems. Repair is still needed on some sections on Flow Master (TBA later in September! ), but the source of most of the problems is greatly improved. Thank you to the staff at West Fraser for listening to our concerns and working with HMBA to resolve them! Working on channel diversion after the road was re-graded. In July, a guest sign-in book was placed at the Hinton Bike Park. The park has had quite a few visitors sign-in! These two images show where they were from. Hint: the larger the name, the higher the number of visits from that location. These are locations across Alberta and excludes Hinton. These are locations beyond Alberta. The Happy Creek Trail system has a new addition in the form of a short but sweet 0.6 km technical downhill trail option. Similar to "Fast Trax", this trail is located along the Bighorn Trail (town connector) and deposits onto Happy Creek East. This is an advanced trail, walk before you ride! "Rock Band" started as a mapping day-dream, with layers derived through GIS to spot a clearly elevated band of bedrock. Once in the field, some of the rock was exposed with protruding ledges and faces with features that a few riders commented would make for some gnarly drops. Rock Band is designed as an advanced trail that can be rocked or rolled, depending on the amps you're cranking! Thrash it or groove it, whatever way you choose it, just don't blow your speakers!! Can't have a Band without Rock Stars! The trail will evolve as it is ridden with new lines and potential, so watch for changing conditions and additional work. Big thanks to a solid crew of builders led by Rock Star Mike Langford who did the bulk of layout and building! The last 40m of Rock Band, before connecting to Happy Creek Trail, challenged (and keeps challenging) our rockin' crew. A wet area made very wet during the last few months with many frequent rain events amped up the band's efforts in finding a sustainable solution. The final phase is 'slated' to be completed by the end of September if the weather finally cooperates! Once onto Happy Creek (East), you can choose a longer ride (left) or continue the descent back to the town trail (right). Rock Band is a black diamond trail that descend from Bighorn Trail to Happy Creek East. Bike Park Project Almost Complete! Awesome work done by HMBA's own Maureen Harper and Bill Heir. They have volunteered many hours of their time in the past few weeks getting our second seacan all spiffed up at the Hinton Bike Park. This is part of the Hinton Community Grant project which was awarded to HMBA back in April this year. The final step will be the installation of a light for the parking area. Maureen Harper, HMBA Directory at Large, on the far right.